Construction of the entrances of the International City project and the Ras Al Khor street improvement project (Ex Al Awir Street) is now 83 per cent complete, Dubai’s Roads and Transport Authority (RTA) has revealed. The project is being undertaken as a result of the traffic impact study for International City – especially after the expansion of Dragon Mart – and the expected growth of traffic density in the area, the RTA said in a statement. It is being constructed in coordination with International City’s main developer Nakheel. “Phase II of the project, which is expected to be opened this March, includes improvements on Al Manama Street and widening the junctions, namely the extension of Al Manama-Al Warsan 1 Street (previously Nouakchott St), Al Manama Street-Sheikh Mohammed bin Zayed Road, and the International City-Al Manama Streets,” said Mattar Al Tayer, director-general and chairman of the RTA. “Improvements of junctions also include the construction of bridges and signalised junctions enabling movement in all directions,” he added. 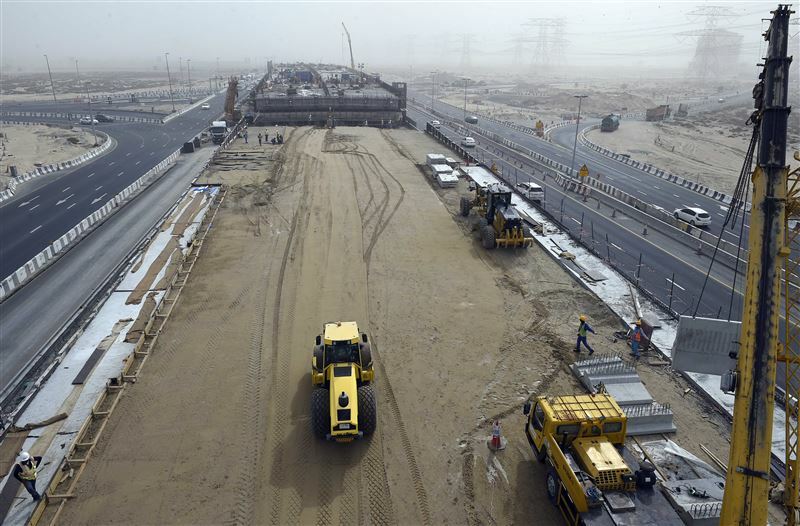 The project includes widening the flyover above Sheikh Mohammed bin Zayed Road from three to four lanes in each direction to increase its capacity from 4,500 to 6,000 vehicles per hour. Al Manama Street will be widened in the sector between Sheikh Mohammed bin Zayed Road and the entrance of the International City from three to six lanes in each direction. This will increase the street capacity by 1,500 vehicles per hour per direction, the RTA said. The street will also be widened from the entrance of International City up to Sheikh Zayed bin Hamdan Al Nahyan Street from two to five lanes in each direction to boost capacity from 3,000 vehicles per hour to 7,500 vehicles per hour. Phase II also includes converting the junction of Al Manama Street and the entrance of the International City to a signalised junction and the construction of a flyover of three lanes in each direction, offering free crossing of Al Manama Street. This will increase the capacity of the street to 4500 vehicles per hour. Works also include changing the intersection of Al Manama with Warsan Street 1 (previously Nouakchott Street) to a signalised junction enabling movement in all directions. A two-lane flyover will be constructed to serve the traffic from Warsan Street 1 to the left in the direction of Sheikh Zayed bin Hamdan Al Nahyan Street. It will increase the capacity of the intersection by 3000 vehicles per hour. The RTA opened the first phase of the Ras Al Khor and the entrances of the International City project in July 2018. Works included improvements on Ras Al Khor Street from Sheikh Mohammed bin Zayed Road to Sheikh Zayed bin Hamdan Al Nahyan Street. A two-lane flyover had been constructed between Warsan 1 and Ras Al Khor Streets enabling free traffic from Warsan 1 Street to Ras Al Khor Street to the west (in the direction of Dubai Downtown). It included U-turns for traffic from Ras Al Khor Street to Sheikh Mohammed bin Zayed Road and a service road in both directions of Ras Al Khor Street to ensure the smooth traffic flow on this key road and separate it from International City, Dragon Mart and Al Warqaa. The 11 million sq ft Dragon City project is a mixed-use master development that currently features Dragon Mart mall and Dragon Mart 2 – a Dhs1bn complex which opened in 2015, doubling the size of the original retail hub to more than 3.5 million sq ft. The third phase of the project – nearing completion – will include a retail showroom with 18 units and a multi-storey car park for 900 vehicles – originally slated to open this year. Nakheel said in 2016 that all of the 118,000 sq ft of leasing space had been booked. Dragon City also includes two hotels – a 251-room ibis Styles that opened in February 2016 and a 304-room Premier Inn which will open in 2019.